Genacol PLUS Review – Is This Product Safe To Use? Genacol PLUS is a harmless and organic health supplement specially designed for joint fitness. The health product consists of two primary ingredients, including Glucosamine, and Hydrolyzed Collagen. The two ingredients have the ability to ease the pain in the back, joints, and the knees. A mixture of glucosamine and collagen is argued to be efficient in maintaining proper functioning of joints and wellbeing. This product is comprised of natural and safe ingredients with the ability to promote joint health. The collagen-glucosamine combination has for many years been used to ensure proper joint functioning and health. Mixed with glucosamine, which aids in lubricating and protecting joints, Genacol PLUS is an ideal 2-in-1 product that offers first-rate value for money. What is the Company Behind Genacol PLUS? Genacol PLUS is a product of Genacol. The company manufactures a broad range of health products using natural ingredients to improve the health and well-being of users. Genacol’s highly efficient products are presently available in more than 40 countries. Genacol is dedicated to providing women and men across the world with the best innovative supplements in regards to efficiency, quality, and safety. The company’s three clinical studies together with its patent-pending technology show that its supplements are innovative, efficient, different, and unique. Responding to the needs of its customers is the company’s continuous commitment and passion. Genacol is dedicated to its customers’ well-being through their healthy aging and joint health. Since its inception, Genacol has made it its mission to offer new and innovative products to customers. Presently, the company maintains eight different products and holds the first position in the joint health category. What are the Ingredients Used in Genacol PLUS? Genacol PLUS Review-Does It Actually Work? Genacol PLUS has a proven working mechanism. The supplement functions by stimulating the body to produce collagen. According to studies, high collagen levels in the body are crucial in promoting joint health. Collagen is used by the body to manufacture cartilage, skin’s white fibers, and tendons among other critical connective tissues. Collagen is a naturally occurring protein that bears most of the body’s structural support. Moreover, collagen is the main component of connective tissues. For that reason, Genacol PLUS provides the body with more collagen to aid in the development of healthy joints. What are the Pros of Genacol PLUS? What are the Cons of Genacol PLUS? What Are The Possible Side Effects Of Genacol PLUS? Genacol PLUS appears to be safe. However, the product’s official site claims that first-time consumers might experience intestinal discomfort from time to time when using the product. When looking for an effective remedy for knees, back, hands joints, safety, and quality is very important. Almost everybody experiences pain in the joint area despite their age. Active lifestyles and daily activities are alleged to have positive effects on our bodies. For this reason, people have a responsibility to take care of their bodies. When your joints hurt, your flexibility and mobility are at stake. Genacol PLUS is a supplement designed using quality ingredients to make sure that your joints stay healthy. Moreover, its ingredients have the right properties to ensure that your cartilages stay protected all the time to avoid damage. 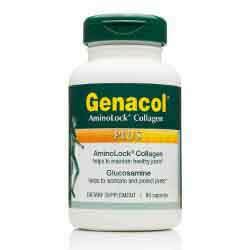 Genacol claims that the supplement will treat all your joint pains including those inflicted by injury. Additionally, the supplement is claimed to be an effective treatment for joint pains related to aging. Genacol PLUS is manufactured using three clinically tested ingredients. Absorbable collagen is used to ensure that the product works as required. Genacol has provided sufficient information about the supplement. Therefore, users should consider going through it to learn more about Genacol PLUS and compare it with other supplements before choosing the most effective. Is Genacol plus compatible with lozartan?